Perhaps you’ve noticed your gums have been feeling particularly red, puffy, and sensitive. You might even see a few spots of blood while brushing or flossing. Both of these symptoms are early signs of periodontal (gum) disease. If left untreated, they could develop into a much more serious problem, such as permanent tooth loss. To make sure you don’t become one of the 64.7 million people suffering from periodontitis – half of all Americans aged 30 and over – you should know what to look for and the steps to take to fix the problem before it gets worse. Periodontal disease is the medical term for what is more commonly known as gum disease. Our gums, the fleshy structure that supports our teeth, are naturally pink. When they are inflamed, they will appear red and swollen and, over the course of time, will wear away. This is important because the gums protect our teeth and mouths from dangerous bacteria. Without them, not only are you are risk of losing your teeth, but periodontal disease has also been shown to increase your risk of getting diabetes, heart disease, and dementia. Fortunately gum disease is preventable, especially in its earliest form. Gingivitis literally translates to inflammation of the “gingival,” the clinical term for gums. This stage is caused by a buildup of plaque in and around the teeth. Plaque is made up of millions of bacteria and when these bacteria come into contact with the gums, they can make them red, swollen, and sensitive – causing blood to appear during brushing or flossing. If the gingivitis is not stopped or treated early, the inflammation will get worse as the plaque turns into tartar – a harder, calcified form of plaque that sticks to your teeth. As gum disease progresses it causes pockets to form between the teeth and gums. As plaque and tartar accumulate below the surface of the gums, the risk for more serious infection and tooth decay is increased. In advanced periodontitis, the pockets continue to deepen putting the bones that hold the teeth at risk. As the infection worsens, the pockets may also fill with pus. At this point your teeth might loosen or fall out. 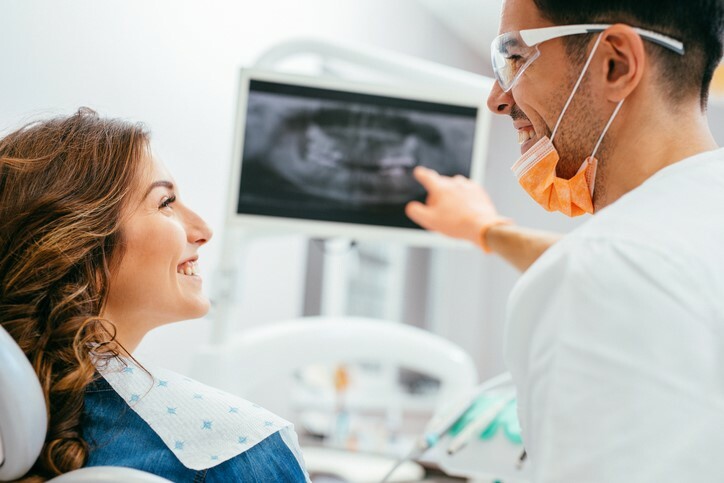 This stage of gum disease is irreversible, though dental implants (replacement teeth) are one option for people suffering from serious periodontitis. We’ve explained how periodontal disease can turn from a little blood in the sink after brushing into a painful and scary condition, affecting more than just your oral health. If you think your gums are showing signs of gingivitis, the best thing to do is make an appointment with your dentist as soon as possible. Early stages of periodontitis can be reversed with regular cleanings, daily flossing, and proper tooth brushing. If you are in the second stage of periodontitis, there are several options for treatment as well. The most common is called root planing, which is a deep cleaning to remove plaque and tartar from the root of your teeth including any periodontal pockets. Above all, remember: The earlier you identify and begin a treatment plan, the better your prospects are for a happy, healthy smile now and in the future. Don’t wait! Contact us to schedule your appointment with one of our friendly dental professionals today.